Audio: soundboard, 23 minutes, A. Source: The Playhouse 1993 SBD 2CD. audience (Toshiba stereo recorder with tieclip mic, recorded from seat 16 in Row A of the stalls, on Maxell XLII C100 cassettes), 112 minutes, B+. Source: lurid_uk, DAD. audience (Sony WM-D3 with a 1-point Sony stereo microphone, recorded from the right orchestra, approx. row 20, on Maxell MX-S cassettes), 113 minutes, B+. Source: DAD. audience, same recording as above, remastered, 112 minutes, B+. Source: DAD. soundboard, 115 minutes, A. 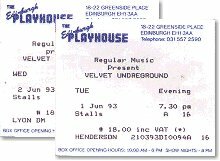 Source: The Playhouse 1993 SBD 2-CD (1-22). audience (using a Toshiba KT4087 stereo recorder and tieclip mic, from seat 25 in Row E of the stalls, on Maxell XL11 C100 cassettes), 125 minutes, B+. Sources: DAD, master seeded by lurid_uk (1-22). in The Scotsman Weekend, May 29, 1993 (p. 21). in The Sunday Times Scotland, May 30, 1993 (p. 10). Crushed Velvet by Pat Kane. in The New York Times, June 5, 1993.
in The Free Lance-Star, June 12, 1993 (p. D1-D2). in Rock & Folk no. 311, July 1993 (p. 49-53). Photos: 5 color photos by Claude Gassian in Rock & Folk #311.
source: So Happy To Be Back CD (edited 73-minute version: 4-8, 10-12, 14-16, 18-20). 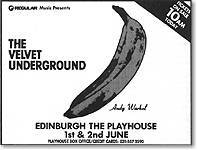 Review: Velvet Underground - Forum, London by Julia Hilger. audience, 129 minutes (1-23), B++. Source: Take A Trip 2CD. audience, DAT, 131 minutes (1-23), B++. Source: master clone seeded by bobfather on DAD. audience, DAT, Sony TCD-D3 with Sonic Studios DSM-6 mic, 122 minutes (1-23), B++. Source: EBR master recording, seeded by Leadville200 on DAD. audience, DAT, unknown recorder/mic, 131 minutes (1-23), B++. Source: master clone seeded on DAD. 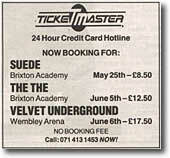 in Melody Maker, April 13, 1993 (p. 22). 800-1200 people (smallest place of the tour). Audio: audience DAT, 125 min. Video: Guess I'm Falling In Love excerpt broadcasted on French M6 TV on February 18, 1996 in Rock Express show. audience (Sony TCD-D7 DAT), 134 minutes (1-22), B+. Source: flipp022 (ane), master seeded on DAD. audience (DAT), 127 minutes (1-15 [cut], 17-22), B+. Poster: 33 x 23 ½ inch, Andy Warhol's Banana artwork printed on a background of metallic silver ink. Video: audience, 153 minutes, B+. Source: VUT. Audio: Lou forgets words to Sweet Jane. 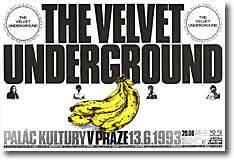 source: Velvet Underground 1993 bootleg 2CD (1-23). audience (Sony WM-D6 with extra microphone, recorded from a seat on the left side of the hall about 15 meters from the stage), 147 minutes, B+. source: minimax, master seeded at DAD. With President Vaclav Havel in attendance. Audio: longest Hey Mr. Rain of the tour - almost 17 minutes! audience DAT (Sony TCD-D3, 3rd row center), 128 minutes, complete (1-22), B+. Source: DAD (1st gen cassette). audience, 121 minutes, incomplete (1-20), B-. Source: DAD. audience DAT, 120 minutes, incomplete (1-13, 15-22), B+. Source: DAD. Review: by Emanuelle Debaussart in Best #301, p. 88.
source: Live MCMXCIII 2CD (4). Reviews: Live! Olympia, Paris, France June 15-17 by Ira Kaplan in SPIN, Volume 9, Number 6, September 1993 (p 129-130). source: Live MCMXCIII 2CD (1-2, 5-14, 16-17, 19-21, 23). source: Live In Europe '93 | The Whole Thing bootleg 2CD (1-23). Video: pro. Source: Velvet Redux Live MCMXCIII VHS/DVD (2, 7-8, 10-13, 16, 20-21, 23). source: Live MCMXCIII 2CD (3, 15, 18, 22). alternate audience (of lesser sound quality & running slighlty too fast), 137 min (1-23). Video: pro. Source: Velvet Redux Live MCMXCIII VHS/DVD (6, 15, 18, 22). audience, 125 minutes, C+. Source: 20.6.93 Berlin - Die Halle 2-LP. audience DAT, 126 minutes, B++. Source: DAD. Video: audience, 56 minutes, C+. audience, 54 minutes, C+ (probably sourced from video, Rock And Roll cut at intro). audience (recorded from the first row right in front of the speaker stack on the left side of the stage, with Sony TCD D7 DAT and Aiwa CM 30 microphone), 55 minutes, B+. Source: master seeded by colonelparker on DAD. pro: Glastonbury film by Julian Temple has a brief excerpt of The Velvet Underground performing All Tomorrow's Parties. source: 1st gen seeded on DAD. by François Ducray in Best #301 (p. 54). by Paul Alessandrini in Rock & Folk #312 (p. 16). Audio: great I Can't Stand It. audience (Sony WM-D6C cassette recorder with Sony ECM-929LT mic), 97 minutes (1-16), B+. Source: master seeded on DAD by The Velvet Taper. audience (Sony WM-D3 cassette recorder with Sony PC-62 mic), 91 minutes, B. Source: master seeded on DAD by willer. audience, 72 minutes (1, 3-16), "B+". Source: Ossi Park bootleg CD. Speed is all wrong, song order juggled, Sweet Jane is missing. Video: audience, 101 minutes. Little bottom noisy crowd, Lou rises guitarwise. Poster: with next show in Milano. Video: audience, 90 minutes (2-5, 7-16). audience (probably from video), 80 minutes, (2-5, 7-16). Last concert of the tour as headliners. Audio: audience, 130 min. Features What Goes On. 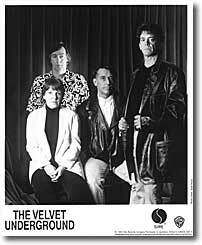 Sources: Velvet 1993 2-CD, With Us From The Past 2-CD, Afterhours #61. 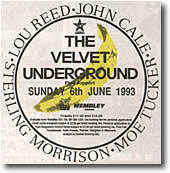 Audio: audience, 55 minutes, very poor quality... With Bono joining in the Velvet Underground for Satellite Of Love. Special thanks to Lau Buur Nielsen, Gordon Lyon and Aral Sezen; also to Thomas Östreicher for his huge help with Live MCMXCIII audio & video track identification. Thanks: Arjan de Weerd for Rotterdam ticket scan, Willy-Jan van Gemert for the Amsterdam ticket scan, Alfredo Garcia for the Hippodrome de Vincennes info/ticket scan.